The other day I ventured out to Target and found this, the new batmobile for 2011! It's the batmobile from Arkham Asylum, the last batman video game. I'm always on the look out for the newest hotwheels batmobile, and was surprised to see this. The last released batmobile was, The Batman- batmobile. I never would have guessed that they would choose to release this particular car, but I'm not complaining at all. Right now it is not listed on the hotwheels website. 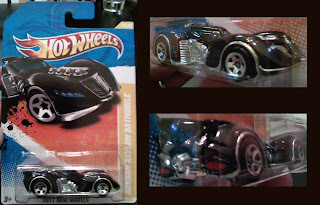 If you like the batmobile series with hotwheels, I would say this is one of the best new models I've seen in a while.